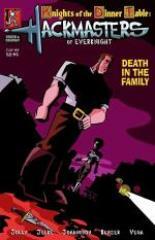 #8 "Death in the Family"
Two EverKnights are dead. Sturm Pyre has a termite infestation. Kevlar, Steve, Stubby and the Priestess are in the dark clutches of the renegade HackMaster, Poadrus. Skraag Fallow is really pissed off. Join us as the Hack hits the fan, pitting brother against brother in a knockdown, drag out, no holds barred, rock’em, sock’em rumble that will change the face of the HackMasters of EverKnight forever. Well, at least someone’s face will get rearranged! Be here as the death count rises and another EverKnight bites the big one in Death in the Family.